Unplug. Unwind. Relax. Refresh. Renew. Reconnect. Northwood's Four-Season Cedar Chalet style year round home with western exposure, private wooded setting, and great views! This smoke and pet freeo home is comfortable, clean, and quiet! Nestled in the midst of the popular Hayward Lakes vacation land paradise and located just 20 minutes from downtown Hayward, Stone Lake, and Telemark/Cable. Close to the end of the road on an elevated, private, and 2.3 wooded acreage, and 230' of frontage. Located on quiet, smaller 80 acre Indian Lake with public boat landing and private dock. Within a couple miles of Lac Courte Oreilles, which is 5,039 acres and one of the deepest and largest lakes in Wisconsin, and Grindstone. Kids spend hours playing in the water, sand, and using the water toys. This very clean SMOKE free 1616 S.F. lake home features three bedrooms (queen in two main floor bedrooms, twin over twin bunk beds and full in downstairs bedroom), PLUS sleeping loft with full size futon (first pick by teenagers) and PLUS reading/sleeping nook with twin size mattress (little ones love this special spot! ), A/C, washer/dryer, open kitchen/dining/living room great for entertaining, wood floors on main level, ash wood ceiling throughout for a true Northwoods feel, two full bathrooms, full amenities/equipped kitchen, ample windows, large lakeside deck that runs the length of the house and offers great views of the lake and woods, lower level walkout, 14x14 screened in porch, private dock, public boat landing, beautiful fireplace and surround in lower level, lower level family room is a walkout with a lake view, electric fireplace on main level, sofa sleeper in lower level family room, and so much more! Located just under three hours from Minneapolis/St. Paul and around seven hours from Chicago. Close to casinos, golf courses, restaurants, attractions, area events, and festivals, near Stone Lake and the Cranberry Festival, Cable, Telemark, Birkiebeiner ski trails, Hayward Golf, Hayward Fat Tire Race and Trails, Fall Colors Tour, four-wheeling, skiing, Northern WI, Northwest WI, 1 1/2 to Apostle Islands, Bayfield, and Copper Falls, seven miles from casino Hayward is recreational destination with many lakes nearby, hiking, biking, horseshoeing, snowmobile and ATV trails (Connects at end of the road. See http://www.sawyercountyalliance.com/2013_2014map/map.html for trail maps ... Green 777 & 30 and Red 3 are off of our road), cross-country skiing, and more. Enjoy paddling around the lake and the peacefulness and beauty all around. Hire a local fishing guide. Love the nooks --n-crannies . . . Enjoyed down time, relaxing, and being unplugged for the week . . . Peaceful and beautiful . . . What a wonderful retreat . . . We had a blast hanging out and playing games . . . Four-wheeling, fishing, and fun . . . Wonderful time hanging out, spending time in the quaint little town of Hayward, eating, and playing games . . . Canoed the entire lake and saw loons, a bald eagle, and beaver lodge . . . Fantastic and serene place . . . Great getaway to celebrate our anniversary . . . Our kids fell in love with your place and loved the neat sleeping spots like the loft and nook under the stairs . . .. Enjoyed time in solitude and time of renewal . . . Loved listening to the loons . . . Our kids argued over sleeping in the special space under the stairs so we had to rotate nights . . . Beautiful Lake setting . . . The leaves are changing, the sky is blue, this lake place is a great place, to get away to . . . The fire pit was awesome, the stars were bright, and the call of the loons were mesmerizing. I've never laughed so hard in my life. Thanks for the memories . . . Much needed father/son time . . . What a great way to spend a winter weekend; sledding, tubing, snowmobiling, ice fishing, bonfire, eating, playing games, and skating on the lake . . . Appreciated your beautiful home and wilderness setting . . . Had fun checking out many wonderful local restaurants . . . So peaceful, private, and quiet . . . The fall colors were incredible . . . No worries and complete and much needed relaxation . . . What a wonderfully magnificent escape . . . This place is superb . . . So thankful for the getaway opportunity at this special place . . . The views of the lake are great . . . We thoroughly enjoyed our morning coffee and reading on the deck while listening to the birds . . . Overdue therapeutic escape . . . Had a delightful time with family and friends . . . What an opportunity for all of us to spend time on the deck reflecting on the beautiful creation that is surrounding us . . . Great place to start and end our days as we enjoyed day trips to Copper Falls, Bayfield and the Apostle Islands . . . The canoe and fishing off the dock entertained our kids for hours while we relaxed by the fire . . . Totally relaxed and enjoyed the calls of nature . . . Fun antique shops in the area . . . Great memories were made. Enjoyed exploring and shopping in town. The candy store was amazing and ice cream was delicious . . . Much needed break to reconnect and relax . . . Perfect and inviting . . . Late nights, great food, laughter, games, hot bon fires, fishing off the dock, quality time with family . . . The kids enjoyed foosball, and darts . . . our teenager loved having his own space in the loft . . . We are in awe of this special place, quality construction, and the beautiful surroundings . . . Fantastic hideaway, delightful views, beautiful lakeside retreat . . . Fun time exploring the lakeshore and walking across the lake during the winter months . . . Such a great selection of movies that we enjoyed a movie marathon . . . All of us had such a great time; inside and out . . . Appreciated the movie selection for kids . . . Relaxing time reading and soaking in the sunshine on the deck . . . The kids had a good time sledding on the hills and onto the lake . . . Relaxing time, ,fun games, and delicious meals, including hobo dinner over the bonfire and BBQ on the grill . . . Convenient location for area golf courses and the LCO casino . . . Very peaceful and secluded . . . Convenient location to hop on the trails and spend time in town . . . The boys fished a lot and had fun catching frogs . . . Appreciated the many amenities in the kitchen and having to pack less . . . Thank you for sharing your delightful home . . . Wonderful time and truly enjoyed the beauty around us . . . Things couldn't have been better. It's just what our family needed . . . Enjoyed berry picking along the road . . . A wonderful sanctuary to enjoy uninterrupted prayer time with two other couples . . . Great ladies weekend and time away; wine tasting, visiting over morning coffee, beautiful sunrises and sunsets, laughing, and just lounging. My favorite thing to do is spending time on the paddle boat. I like paddle boating because I get to see a lot of animals like beavers, loons, frogs, ducks, and fish. My little brother likes to fish. It's my favorite place to be! Family living in a suburb of a busy metropolitan area who appreciates a getaway that is "north of the tension zone" and a break from the busyness of life! Perfect setting for quality time with loved ones and making memories. Laughter, relaxation, and peace found here! We love the Hayward Lakes area and charm of the Northwoods. We also own the lake lot next to the cabin for additional privacy and lake frontage. When we first started looking, we thought we wanted and would enjoy the hustle and bustle of a larger lake community, but then we found this property. Now we can't imagine being anywhere else. We love the sunsets, the woods, the water, and the simple sounds of wildlife and beauty of nature. It's a setting that's good for the soul. Newer construction and quality built. Built for year round use and to make the most of the seasons. Comfortable and clean "up north" feel with many modern conveniences! Connect to trails at the end of the road. No need to trailer elsewhere. Tile floors, hot water, fans and heat lamps, cabinets for storage, and clean. Beautiful view of quiet and peaceful Indian Lake. Nice and cool, but highly recommend opening the windows and letting the fresh air in and listening to the sounds of nature, including loons at night! All hotel quality white towels. Please don't use for anything other than showering. Please bring towel for make up, cleaning shoes, and beach towels. Open floor plan and entertaining space. Two swivel chairs in the living room work great for conversation with those in the kitchen and dining area. Lower level has dartboard, foosball, and a Wii. Great for cold or rain days! Many games and puzzles to choose from. Wii available to use. Dartboard, foosball, and horseshoes. Toys and books available for kids! Wii Game Console. Bring your favorite games for a rainy day activity! Two adult kayaks. Some life jackets available to use. 14x14 screened in porch and large lakeside deck that runs the length of the home! Love sitting on the deck in the morning, sipping coffee, and listening to the birds. Fire pit and firewood for bonfires by the lake and under the stars! Chances are you'll hear the beautiful call of the loons at night. Lovely, comfortable, and spacious cabin! What a beautiful place! This was perfect our family- it even had some toys for little ones to play with! The owner was very communicative and made sure everything was all set for our arrival. Thank you! Our family stayed for a weekend before their start back to school and it was just what we all needed. The cabin provided a place to relax, put together a puzzle, walk on a frozen lake, and see the stars at night. We were very sad to have to leave! Amazing experience as always! The only trouble we had was getting 2 trailers in driveway! This last weekend I had the pleasure of staying at this beautiful cabin. Just far enough from town, but close enough to everything needed. The cabin is great for small, and medium parties. The screened porch, firepit and living areas were great to use over the weekend. The large deck on the back was nice to have when the sun was out, or looking up at the stars. I look forward to going back up to this cabin next year. The cabin is right on the UTV trail and has great fishing off the dock. I hope you enjoy your stay as much as we did! The cabin and settings were wonderful. We were there for the Chequamegon 40 fat tire race and the location was excellent. The views from the cabin are serene. The loons calling in the distance were enchanting. The weekend was much too short! We loved our week at the Northwoods Lakeside Retreat! It was the perfect blend of modern convenience and rustic retreat. It was great to be on a smaller lake with few motors so the kids could paddle around in the kayaks, swim and fish with ease. Everything was clear and easy to use as far as instructions. Beautiful setting. Short drive into Hayward for fun activities, eating out, and groceries. We'd definitely come back! 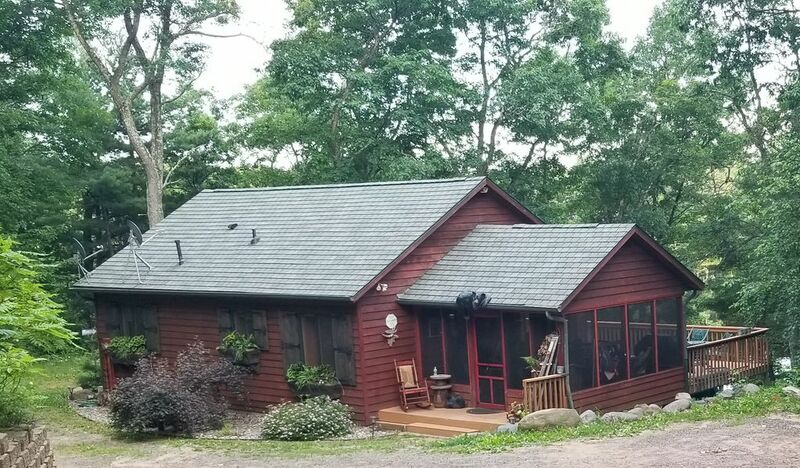 Enjoy the charm of the north woods and water at this peaceful, secluded, and private year round lake home retreat located on quiet Indian Lake, 2.3 wooded acreage, and 230' of frontage. Nestled in the midst of the popular Hayward Lakes vacation land paradise it is located just 20 minutes from downtown Hayward, Stone Lake, and Telemark/Cable. Located on ATV Trail #777 which connects to Snowmobile Trail #3 and a short distance to Trails #9 & #30. No need to trailer elsewhere and there's room to park a couple of trailers. Enjoy over 600 miles of groomed trails! For more trail information, please see www.haywardlakes.com. Quality built, comfortable, clean, modern with cabin feel, and very quiet! VRBO adds a service fee at time of booking. As a property owner, we do not receive any of this fee, which is why we allow and encourage you to pay directly. Sorry, due to serious allergies, no smoking or pets allowed. No exceptions. Check in days during off peak months (Oct-May) are flexible and based on availability.